Not to be confused with North Atlantic oscillation. Atlantic multidecadal oscillation spatial pattern obtained as the regression of monthly HadISST sea surface temperature anomalies (1870-2013). Atlantic Multidecadal Oscillation Index according to the methodology proposed by van Oldenborgh et al. 1880-2018. Atlantic Multidecadal Oscillation index computed as the linearly detrended North Atlantic sea surface temperature anomalies 1856-2013. The Atlantic Multidecadal Oscillation (AMO) is a climate cycle that affects the sea surface temperature (SST) of the North Atlantic Ocean based on different modes on multidecadal timescales. While there is some support for this mode in models and in historical observations, controversy exists with regard to its amplitude, and in particular, the attribution of sea surface temperature change to natural or anthropogenic causes, especially in tropical Atlantic areas important for hurricane development. The Atlantic multidecadal oscillation is also connected with shifts in hurricane activity, rainfall patterns and intensity, and changes in fish populations. The Atlantic Multidecadal Oscillation (AMO) was identified by Schlesinger and Ramankutty in 1994. The AMO signal is usually defined from the patterns of SST variability in the North Atlantic once any linear trend has been removed. This detrending is intended to remove the influence of greenhouse gas-induced global warming from the analysis. However, if the global warming signal is significantly non-linear in time (i.e. not just a smooth linear increase), variations in the forced signal will leak into the AMO definition. Consequently, correlations with the AMO index may mask effects of global warming. Several methods have been proposed to remove the global trend and El Niño-Southern Oscillation (ENSO) influence over the North Atlantic SST. Trenberth and Shea, assuming that the effect of global forcing over the North Atlantic is similar to the global ocean, subtracted the global (60°N-60°S) mean SST from the North Atlantic SST to derive a revised AMO index. Ting et al. however argue that the forced SST pattern is not globally uniform; they separated the forced and internally generated variability using signal to noise maximizing EOF analysis. Van Oldenborgh et al. derived an AMO index as the SST averaged over the extra-tropical North Atlantic (to remove the influence of ENSO that is greater at tropical latitude) minus the regression on global mean temperature. Guan and Nigam removed the non stationary global trend and Pacific natural variability before applying an EOF analysis to the residual North Atlantic SST. The linearly detrended index suggests that the North Atlantic SST anomaly at the end of the twentieth century is equally divided between the externally forced component and internally generated variability, and that the current peak is similar to middle twentieth century; by contrast the others methodology suggest that a large portion of the North Atlantic anomaly at the end of the twentieth century is externally forced. Frajka-Williams et al. 2017 pointed out that recent changes in cooling of the subpolar gyre, warm temperatures in the subtropics and cool anomalies over the tropics, increased the spatial distribution of meridional gradient in sea surface temperatures, which is not captured by the AMO Index. Based on the about 150-year instrumental record a quasi-periodicity of about 70 years, with a few distinct warmer phases between ca. 1930–1965 and after 1995, and cool between 1900–1930 and 1965–1995 has been identified. In models, AMO-like variability is associated with small changes in the North Atlantic branch of the Thermohaline Circulation. However, historical oceanic observations are not sufficient to associate the derived AMO index to present-day circulation anomalies. Models and observations indicate that changes in atmospheric circulation, which induce changes in clouds, atmospheric dust and surface heat flux, are largely responsible for the tropical portion of the AMO. The Atlantic Multidecadal Oscillation (AMO) is important for how external forcings are linked with North Atlantic SSTs. The AMO is correlated to air temperatures and rainfall over much of the Northern Hemisphere, in particular in the summer climate in North America and Europe. Through changes in atmospheric circulation, the AMO can also modulate spring snowfall over the Alps  and glaciers' mass variability. Rainfall patterns are affected in North Eastern Brazilian and African Sahel. It is also associated with changes in the frequency of North American droughts and is reflected in the frequency of severe Atlantic hurricane activity. Recent research suggests that the AMO is related to the past occurrence of major droughts in the US Midwest and the Southwest. When the AMO is in its warm phase, these droughts tend to be more frequent or prolonged. Two of the most severe droughts of the 20th century occurred during the positive AMO between 1925 and 1965: The Dust Bowl of the 1930s and the 1950s drought. Florida and the Pacific Northwest tend to be the opposite—warm AMO, more rainfall. Climate models suggest that a warm phase of the AMO strengthens the summer rainfall over India and Sahel and the North Atlantic tropical cyclone activity. Paleoclimatologic studies have confirmed this pattern—increased rainfall in AMO warmphase, decreased in cold phase—for the Sahel over the past 3,000 years. North Atlantic tropical cyclone activity according to the Accumulated Cyclone Energy Index, 1950–2015. For a global ACE graph visit this link. A 2008 study correlated the Atlantic Multidecadal Mode (AMM), with HURDAT data (1851–2007), and noted a positive linear trend for minor hurricanes (category 1 and 2), but removed when the authors adjusted their model for undercounted storms, and stated "If there is an increase in hurricane activity connected to a greenhouse gas induced global warming, it is currently obscured by the 60 year quasi-periodic cycle." With full consideration of meteorological science, the number of tropical storms that can mature into severe hurricanes is much greater during warm phases of the AMO than during cool phases, at least twice as many; the AMO is reflected in the frequency of severe Atlantic hurricanes. [unreliable source] Based on the typical duration of negative and positive phases of the AMO, the current warm regime is expected to persist at least until 2015 and possibly as late as 2035. Enfield et al. assume a peak around 2020. Since 1995, there have been nine Atlantic hurricane seasons considered "extremely active" by Accumulated Cyclone Energy - 1995, 1996, 1998, 1999, 2003, 2004, 2005, 2010 and 2017. There are only about 130–150 years of data based on instrument data, which are too few samples for conventional statistical approaches. With the aid of multi-century proxy reconstruction, a longer period of 424 years was used by Enfield and Cid–Serrano as an illustration of an approach as described in their paper called "The Probabilistic Projection of Climate Risk". Their histogram of zero crossing intervals from a set of five re-sampled and smoothed version of Gray et al. (2004) index together with the maximum likelihood estimate gamma distribution fit to the histogram, showed that the largest frequency of regime interval was around 10–20 year. The cumulative probability for all intervals 20 years or less was about 70%. There is no demonstrated predictability for when the AMO will switch, in any deterministic sense. Computer models, such as those that predict El Niño, are far from being able to do this. Enfield and colleagues have calculated the probability that a change in the AMO will occur within a given future time frame, assuming that historical variability persists. Probabilistic projections of this kind may prove to be useful for long-term planning in climate sensitive applications, such as water management. A 2017 study predicts a continued cooling shift beginning 2014, and the authors note, "..unlike the last cold period in the Atlantic, the spatial pattern of sea surface temperature anomalies in the Atlantic is not uniformly cool, but instead has anomalously cold temperatures in the subpolar gyre, warm temperatures in the subtropics and cool anomalies over the tropics. The tripole pattern of anomalies has increased the subpolar to subtropical meridional gradient in SSTs, which are not represented by the AMO index value, but which may lead to increased atmospheric baroclinicity and storminess." ^ Gerard D. McCarthy; Ivan D. Haigh; Joël J.M. Hirschi; Jeremy P. Grist & David A. Smeed (27 May 2015). "Ocean impact on decadal Atlantic climate variability revealed by sea-level observations". Nature. 521 (7553): 508–510. Bibcode:2015Natur.521..508M. doi:10.1038/nature14491. PMID 26017453. ^ a b c Mingfang, Ting; Yochanan Kushnir; Richard Seager; Cuihua Li (2009). 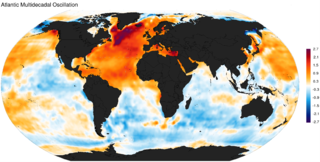 "Forced and Internal Twentieth-Century SST Trends in the North Atlantic". Journal of Climate. 22 (6): 1469–1481. Bibcode:2009JCli...22.1469T. doi:10.1175/2008JCLI2561.1. ^ Schlesinger, M. E. (1994). "An oscillation in the global climate system of period 65-70 years". Nature. 367 (6465): 723–726. Bibcode:1994Natur.367..723S. doi:10.1038/367723a0. ^ Mann, Michael; Byron A. Steinman; Sonya K. Miller (2014). "On forced temperature changes, internal variability, and the AMO". Geophysical Research Letters. 41 (9): 3211–3219. Bibcode:2014GeoRL..41.3211M. doi:10.1002/2014GL059233. ^ a b Trenberth, Kevin; Dennis J. Shea (2005). "Atlantic hurricanes and natural variability in 2005". Geophysical Research Letters. 33 (12): L12704. Bibcode:2006GeoRL..3312704T. doi:10.1029/2006GL026894. ^ van Oldenborgh, G. J.; L. A. te Raa; H. A. Dijkstra; S. Y. Philip (2009). "Frequency- or amplitude-dependent effects of the Atlantic meridional overturning on the tropical Pacific Ocean". Ocean Sci. 5 (3): 293–301. doi:10.5194/os-5-293-2009. ^ Guan, Bin; Sumant Nigam (2009). "Analysis of Atlantic SST Variability Factoring Interbasin Links and the Secular Trend: Clarified Structure of the Atlantic Multidecadal Oscillation". J. Climate. 22 (15): 4228–4240. Bibcode:2009JCli...22.4228G. doi:10.1175/2009JCLI2921.1. ^ "Climate Phenomena and their Relevance for Future Regional Climate Change" (PDF). IPCC AR5. 2014. ^ O'Reilly, C. H.; L. M. Huber; T Woollings; L. Zanna (2016). "The signature of low-frequency oceanic forcing in the Atlantic Multidecadal Oscillation". Geophysical Research Letters. 43 (6): 2810–2818. Bibcode:2016GeoRL..43.2810O. doi:10.1002/2016GL067925. ^ Brown, P. T.; M. S. Lozier; R. Zhang; W. Li (2016). "The necessity of cloud feedback for a basin-scale Atlantic Multidecadal Oscillation". Geophys. Res. Lett. 43 (8): 3955–3963. Bibcode:2016GeoRL..43.3955B. doi:10.1002/2016GL068303. ^ Yuan, T.; L. Oreopoulos; M. Zalinka; H. Yu; J. R. Norris; M. Chin; S. Platnick; K. Meyer (2016). "Positive low cloud and dust feedbacks amplify tropical North Atlantic Multidecadal Oscillation". Geophys. Res. Lett. 43 (3): 1349–1356. Bibcode:2016GeoRL..43.1349Y. doi:10.1002/2016GL067679. ^ Mads Faurschou Knudsen; Bo Holm Jacobsen; Marit-Solveig Seidenkrantz & Jesper Olsen (25 February 2014). "Evidence for external forcing of the Atlantic Multidecadal Oscillation since termination of the Little Ice Age". Nature. 5: 3323. Bibcode:2014NatCo...5E3323K. doi:10.1038/ncomms4323. PMC 3948066. PMID 24567051. ^ Ghosh, Rohit; Müller, Wolfgang A.; Baehr, Johanna; Bader, Jürgen (2016-07-28). "Impact of observed North Atlantic multidecadal variations to European summer climate: a linear baroclinic response to surface heating". Climate Dynamics. 48 (11–12): 3547. Bibcode:2017ClDy...48.3547G. doi:10.1007/s00382-016-3283-4. ISSN 0930-7575. ^ Zampieri, M.; Toreti, A.; Schindler, A.; Scoccimarro, E.; Gualdi, S. (April 2017). "Atlantic multi-decadal oscillation influence on weather regimes over Europe and the Mediterranean in spring and summer". Global and Planetary Change. 151: 92–100. Bibcode:2017GPC...151...92Z. doi:10.1016/j.gloplacha.2016.08.014. ^ Zampieri, Matteo; Scoccimarro, Enrico; Gualdi, Silvio (2013-01-01). "Atlantic influence on spring snowfall over the Alps in the past 150 years". Environmental Research Letters. 8 (3): 034026. Bibcode:2013ERL.....8c4026Z. doi:10.1088/1748-9326/8/3/034026. ISSN 1748-9326. ^ Huss, Matthias; Hock, Regine; Bauder, Andreas; Funk, Martin (2010-05-01). "100-year mass changes in the Swiss Alps linked to the Atlantic Multidecadal Oscillation". Geophysical Research Letters. 37 (10): L10501. Bibcode:2010GeoRL..3710501H. doi:10.1029/2010GL042616. ISSN 1944-8007. ^ Zhang, R.; Delworth, T. L. (2006). "Impact of Atlantic multidecadal oscillations on India/Sahel rainfall and Atlantic hurricanes". Geophys. Res. Lett. 33 (17): L17712. Bibcode:2006GeoRL..3317712Z. doi:10.1029/2006GL026267. ^ Shanahan, T. M.; et al. (2009). "Atlantic Forcing of Persistent Drought in West Africa". Science. 324 (5925): 377–380. Bibcode:2009Sci...324..377S. CiteSeerX 10.1.1.366.1394. doi:10.1126/science.1166352. PMID 19372429. ^ Chylek, P. & Lesins, G. (2008). "Multidecadal variability of Atlantic hurricane activity: 1851–2007". Journal of Geophysical Research. 113 (D22): D22106. Bibcode:2008JGRD..11322106C. doi:10.1029/2008JD010036. ^ Curry, Judith A. (2008). "Potential Increased Hurricane Activity in a Greenhouse Warmed World". In MacCracken, Michael C.; Moore, Frances; Topping, John C. (eds.). Sudden and disruptive climate change. London: Earthscan. pp. 29–38. ISBN 978-1-84407-478-5. Assuming that the AMO continues with a 70-year periodicity, the peak of the next cycle would be expected in 2020 (70 years after the previous 1950 peak). Andronova, N. G.; Schlesinger, M. E. (2000). "Causes of global temperature changes during the 19th and 20th centuries". Geophys. Res. Lett. 27 (14): 2137–2140. Bibcode:2000GeoRL..27.2137A. doi:10.1029/2000GL006109. Delworth, T. L.; Mann, M. E. (2000). "Observed and simulated multidecadal variability in the Northern Hemisphere". Climate Dynamics. 16 (9): 661–676. Bibcode:2000ClDy...16..661D. doi:10.1007/s003820000075. Enfield, D. B.; Mestas-Nunez, A. M.; Trimble, P. J. (2001). "The Atlantic Multidecadal Oscillation and its relationship to rainfall and river flows in the continental U.S." Geophys. Res. Lett. 28 (10): 2077–2080. Bibcode:2001GeoRL..28.2077E. CiteSeerX 10.1.1.594.1411. doi:10.1029/2000GL012745. Goldenberg, S. B. (2001). "The recent increase in Atlantic hurricane activity: Causes and implications". Science. 293 (5529): 474–479. Bibcode:2001Sci...293..474G. doi:10.1126/science.1060040. PMID 11463911. Gray, S. T. (2004). "A tree-ring based reconstruction of the Atlantic Multidecadal Oscillation since 1567 A.D.". Geophys. Res. Lett. 31 (12): L12205. Bibcode:2004GeoRL..3112205G. doi:10.1029/2004GL019932. Hetzinger, Steffen (2008). "Caribbean coral tracks Atlantic Multidecadal Oscillation and past hurricane activity". Geology. 36 (1): 11–14. Bibcode:2008Geo....36...11H. doi:10.1130/G24321A.1. Kerr, R. A. (2000). "A North Atlantic climate pacemaker for the centuries". Science. 288 (5473): 1984–1986. doi:10.1126/science.288.5473.1984. PMID 17835110. Kerr, R. A. (2005). "Atlantic climate pacemaker for millennia past, decades hence?". Science. 309 (5731): 41–43. doi:10.1126/science.309.5731.41. PMID 15994503. Knight, J. R. (2005). "A signature of persistent natural thermohaline circulation cycles in observed climate". Geophys. Res. Lett. 32 (20): L20708. Bibcode:2005GeoRL..3220708K. doi:10.1029/2005GL024233. McCabe, G. J.; Palecki, M. A.; Betancourt, J. L. (2004). "Pacific and Atlantic Ocean influences on multidecadal drought frequency in the United States". PNAS. 101 (12): 4136–4141. Bibcode:2004PNAS..101.4136M. doi:10.1073/pnas.0306738101. PMC 384707. PMID 15016919. Sutton, R. T.; Hodson, L. R. (2005). "Atlantic forcing of North American and European summer climate". Science. 309 (5731): 115–118. Bibcode:2005Sci...309..115S. doi:10.1126/science.1109496. PMID 15994552. Knight, J. R.; Folland, C. K.; Scaife, A. A. (2006). "Climate impacts of the Atlantic Multidecadal Oscillation". Geophys. Res. Lett. 33 (17): L17706. Bibcode:2006GeoRL..3317706K. doi:10.1029/2006GL026242. Teegavarapu, R. S. V.; Goly, A.; Obeysekera, J. (2013). "Influences of Atlantic Multi-Decadal Oscillation on Regional Precipitation Extremes". Journal of Hydrology. 495: 74–93. Bibcode:2013JHyd..495...74T. doi:10.1016/j.jhydrol.2013.05.003. Goly, Aneesh; Teegavarapu, Ramesh S. V. (2014). "Individual and coupled influences of AMO and ENSO on regional precipitation characteristics and extremes". Water Resources Research. 50 (6): 4686–4709. Bibcode:2014WRR....50.4686G. doi:10.1002/2013WR014540. Wikimedia Commons has media related to Atlantic Multidecadal Oscillation.